Both are published by Ed Rayher, who runs/is Swamp Press Letter Foundry. Both are produced from good quality digital scans as print-on-demand paperbacks. The older of the two (published 2011) is “Ornadementia.” It’s a composite volume of the ornament pages from specimen books of Lanston Monotype, Monotype Corp. (UK), Linotype, Intertype, and Ludlow, plus some antiquities. 276pp. 8.5 x 11. (Printed b&w, even when the originals involved color.) $40 postpaid in the USA. Even if you already have most or all of these in original specimen books, it’s very handy to have them all in one volume that you can replace if you ruin it in the shop. 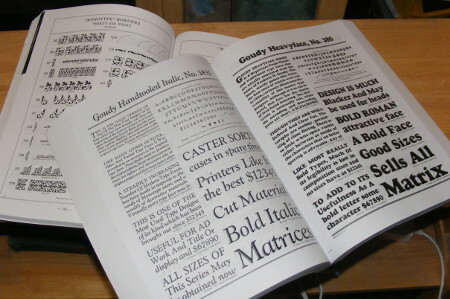 The newer (2013) is a composite Lanston Monotype specimen book. 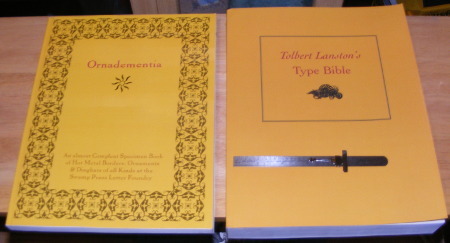 Ed calls it “Tolbert Lanston’s Type Bible.” It contains the type showings from every Lanston specimen that Ed could find. In this sense it is more complete than any actual Lanston specimen. It omits the ornaments, and it omits the sections without showings; in this sense it’s slightly less than complete. He also adds a few showings of non-Lanston faces held by Swamp Press (but, regrettably, he doesn’t include the type for the Cherokee syllabary for which he recently cut matrices). These are the complete showings of the faces in all sizes (with tables of characters in fonts), not the single-size abbreviated showings as found in McGrew. 638pp. 8.5 x 11. $60 postpaid in the USA. So there’s now no need for anyone to be without a Lanston Monotype specimen book (and, again, it’s a useful desk/shop copy even if you do have the originals). Attached are a couple of quick snapshots of these two books, just to give you an idea. Amazon hasn’t heard of these fine volumes. You get them by contacting Swamp Press directly: ed AT swamppress DOT com or Swamp Press, 15 Warwick Road, Northfield, MA 01360. John Barrett of Letterpress Things also sells at least Ornadementia.